To begin year 2016, we’re glad to publish this article by a new member from Kenya, specialized in electrical installations, maintenance and repairs. He told us about his experience (20 years!) and he kindly sent us this article about automatic transfer switches. We tought it was interesting and decided to post it on the blog. 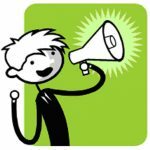 Remember you too can send us material and be published in the Electical Engineering Community blog! Just send us a mail. The automatic transfer switches are used to automatically transfer the load from the utility power to a secondary or backup power source whenever power goes out, or as required. A careful selection of the switch ensures adequate capability, safety, and maximum reliability under both normal and emergency conditions. As such, one must consider technical factors such as the size, type of load, continuous current rating, voltage rating and style. In addition, the price, compatibility and reliability must be considered. Open-transition transfer devices: This works by opening the connected source before connecting to the new one. Causes an interruption for a short time. Fast closed-transition transfer devices which works by paralleling two sources and disconnect one source when both are available. 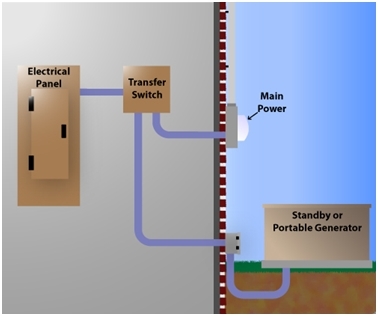 Soft closed-transition devices work in such a way that they actively synchronize the sources when transferring the live sources and connect them together with a ramp load impulse to the backup power source. 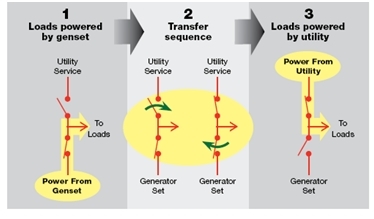 Sub-cycle transfer devices which transfer the control from one source to the other within a quarter of the electrical power cycle hence the interruption is slight. Used in UPS devices. The selection of any of the above modes is based on the type of application; critical loads such as hospital emergence services cannot afford to have any interruptions however small to the life support machines. These types will most likely use the Fast-closed-transition devices, while a commercial building with office equipment and lights can tolerate a few milliseconds of power outage and can therefore use the open transition devices. An automatic transfer switch should be able to supply maximum current for three or more hours to a continuous load. It should be able to carry current to critical loads continuously from utility or emergency power source. The current ratings for automatic transfer switch range from 30 to 400 Amperes. It is recommended that the current rating for ATS match that of the main breaker in the electrical control panel. For example, if you have a 100-amp main breaker, you will need a 100-amp ATS. The different kinds of loads include total system loads, restrictive loads motor, incandescent lamp and electric discharge lamp loads. Almost all transfer switches used for generators are marked to specify which type of load it can handle. An automatic transfer switch that can handle the Total system load is often recommended because it can handle a variety of loads. An automatic transfer switch is one of the only few electrical devices that can be connected to two unsynchronized power sources. This is quite important in that the transfer switch must provide adequate insulation to handle increased voltage stress. Typical AC system voltage ratings are 120, 208, 240, 480, 600 volts and standard frequency is 50 or 60 hertz. Automatic Transfer switch will allow other frequencies and voltages be used when need be. Standard switches: These are the switches where the ATS is installed together with its sub-panel. It is an old fashioned style and is rarely used nowadays due to the extra subpanel that is required. Load centers: This is a combination of both the ATS and the subpanel to a single circuit. This is however limited to powering of small loads in the house and can only handle between 8- 16 mission critical citcuits. Service disconnect: This is an ATS that is best suited for larger generators that power homes with up to 200 Amperes. The service entrance disconnect energizes the entire panel. The switch is the most expensive of the three and usually installed between the meter and electrical panel. In addition, it is easier to install compared to the load center. There several types of automatic transfer switch equipment, each comes with a wide array of features. Selecting the appropriate type requires an understanding of the application and site needs. The ATS must be able to automatically and reliably transfer power between different power sources, either between utility and backup generator or between other types of power sources. Selecting an automatic transfer switch requires a careful consideration of its parameters to ensure the switch will have the capacity to handle the load reliably when outages occur. Even though price is one of the influencing factors, there should be a balance between safety, the level of protection and reliability. However, the more reliable devices that provide power with no interruptions will also translate to higher cost. Do you have any comment to add? Let’s share below! or copy this trackback: http://engineering.electrical-equipment.org/panel-building/how-to-select-an-automatic-transfer-switch-ats.html/trackback from your own site. The UPSs have inbuilt power transfer mechanism that automatically transfer the load to the UPS when there is an outage or disturbance and back to the utility when it comes back and stabilizes. An ATS can be used if there is a generator or solar system. The common output,whether from the generator, utility or solar goes to the UPS. Most Server UPSs have manual bypass switches that allow you to remove power from the UPS and then power the loads directly from the utility or generator, without rewiring. The bypass can also be used during maintenance and repairs, but most are manual. I am not sure that I have answered you clearly, please feel free to ask for an further clarification. My husband and I are building a new home and he wants to ensure we have a backup generator. Our home is in an area that often loses power due to weather. We’ve been trying to determine which type of setup would be best for us. It seems a service disconnect switch style would be best, even though it would cost a bit more. Can you tell us some marks (brands) and references of each ATS type?